Served with dessicated coconut and red sugar, this simple South Indian snack of steamed vermicelli-like noodles is one of my favourite choice for breakfast. Plain and simple as it may seem, not all putu mayam tastes the same. Some sellers heat it up prior to serving the customers while others just dump spoonfuls of 'aged', dry dessicated coconut on it. For me, I found the perfect putu mayam with the slightly moist vermicelli-like noodles served with fresh dessicated coconut and red sugar in the Bendemeer market. whats the operating time ? The store at the Bendemeer market operates till noon I think. 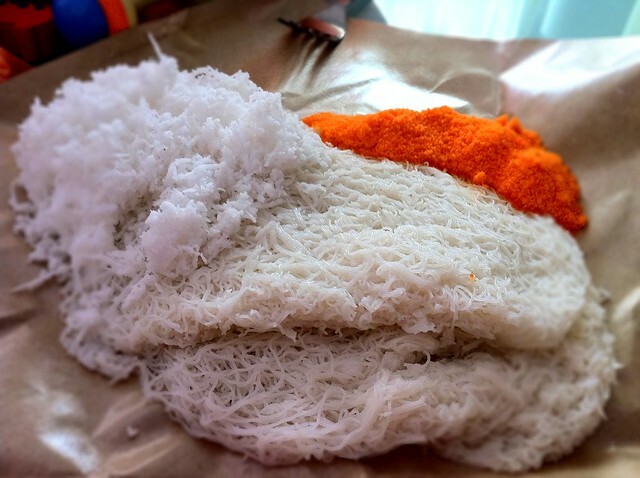 However, you could buy putu mayam from almost anywhere in Singapore!